Collapses flat (8" x 11") Fits in a briefcase, drawer, or instrument case. Can travel with a laptop. Elastic page holder keeps books opened and loose material secure. 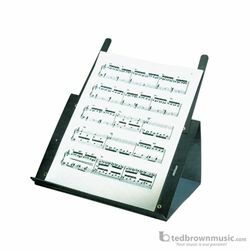 Supports can be adjusted to hold opened sheet music (1"W x 12"H).